SUBHEAD: This endangered species has a distinctive bright red bill. The Alae ula is a bird in Rallidae family, and stands about 13 inches tall. It is a slate gray color, with black on the head and neck. There are white markings on the flanks and under the tail. Most of the bill and and upper shield are bright red, with a small yellow tip. 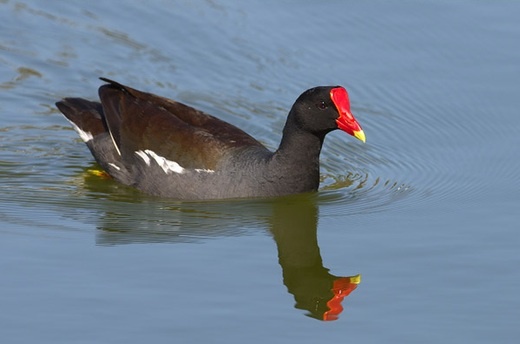 Unlike ducks, the moorhen does not have webbed feet. It walks on long separated toes through marshy vegetation. Legs and feet are a light greenish color. Males are larger than females, and they have chicken-like cackles and croaks. The scientific name is gallinula chloropus sandvicensis, and it is also called the Hawaiian gallinule or Hawaiian Common Moorhen. The Alae ula is a subspecies of the Common gallinule found in North America and Eurasia. While very similar to these relatives, the Hawaiian species has differentiated from its relatives, and no longer migrates. Historically, the bird was found on all the main Hawaiian Islands except for Lanai and Koho olawe. The Alae ula is now found in elevations under 400 feet on most commonly on Kauai and Oahu. There have been reported sightings on the Ke anae peninsula on Maui, and on the Big Island. On Kauai, they are found most often in the Wailua and Hanalei river valleys, in irrigation ditches and taro fields. The birds live around fresh water ponds, marshes, reservoirs, and taro fields. Diet consists of water plants, algae, insects, snails, and grasses. The Alae ula often makes it’s nest in shallow water. It builds platform nests on floating vegetation or flooded reeds. Breeding season is March through August, and appears to be related to water levels. 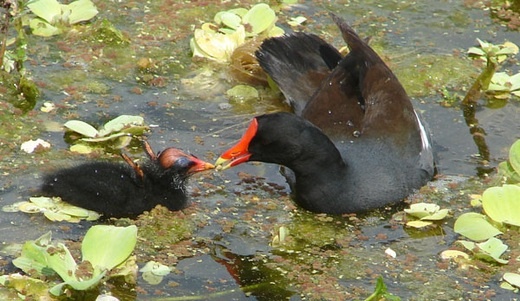 The moorhen lays five or six eggs, which hatch after 22 days. 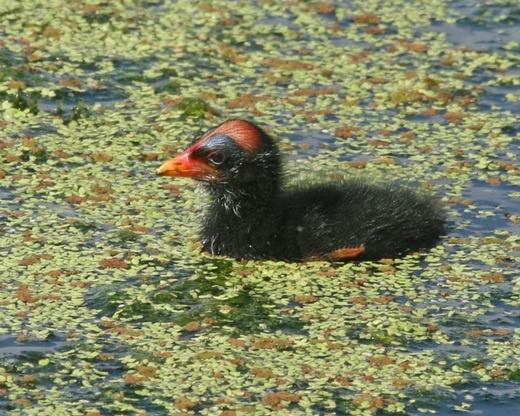 Chicks are covered with black down, and have the bright red beak. They can swim shortly after birth, but are dependent on their parents for several weeks. Immature birds are olive to grayish brown, with a yellow or brown bill. In Hawaiian Mythology, the Alae ula performed a great service to the people. In the old days the Hawaiians did not have the secret of fire to cook or warm themselves. The Alae kea, or white beaked alae, took pity on them. He flew to the home of the gods, the volcano. There he stole a burning torch and brought it back to earth. During the flight, the bird’s white forehead was seared by the fire, and has been a bright red ever since then. From then on the bird was known as Alae ula because of the red mark from the fire. This bird was honored as an amakua, or guardian spirit of individual families. It was also considered by some to be a bad omen. This bird is endemic to Hawaii. Endemic species are native and occur nowhere else. Alae ula was common at the turn of the century, but is now endangered. The average number of individuals counted between 1993 and 2003 was just under 300 individuals. However, the species is secretive and an accurate count is difficult. This species has suffered from habitat loss. Most of the coastal wetland plains in the state have been lost in recent years. There has also been a shift from wetland agriculture to other crops. Predators include many introduced species: dogs, cats, rats, mongoose, cattle egrets, and bullfrogs. There are several introduced plant species that reduce their habitat, including pickleweed, water hyacinth, and mangrove. Conservation efforts include wetland restoration and preservation and prohibiting hunting of the bird. There have been reintroduction of the moorhead to Molokai, with future reintroduction to Maui and the Big Island of Hawaii planned. or go to "Hawaiian Nature" from "Archives Menu"
This bird is also found in Islamabad, Pakistan quite near to my home, in a water pound. This bird is not a duck. It's in the Rallidae family. Anatidae is the family for ducks, geese and swans together. Who knew? We certainly did not. Thanks for the correction. Several comments have mentioned that this bird is common elsewhere in the world, for example Pakistan and India. 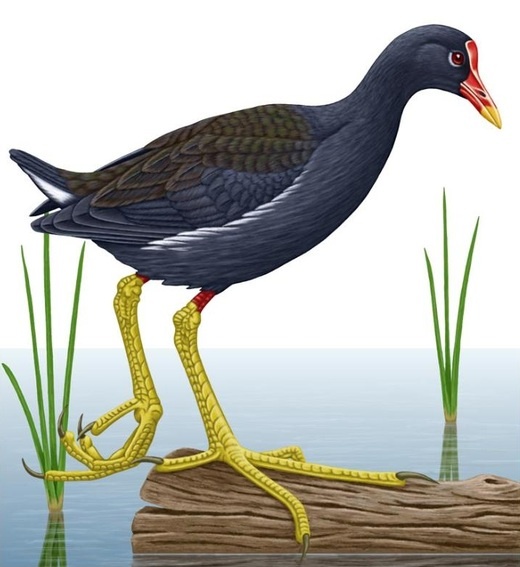 It is worth noting that the species found in Europe, Asia, Australia and North America are not the `Alae `ule or Hawaiian Gallinule, but either the Common Moorhen or Common Gallinule, two similar species with worldwide distributions and a large variety of subspecies. The `Alae `Ula is a distinct subspecies of the North American Common Gallinule, and is totally separate from all other populations of moorhen and gallinule. This is why it has it's endangered status, and is indeed a rare bird. The "Shock Doctrine" here now! Lose property for growing food? Aren't we all Bernie Madoffs? Is Tom Friedman getting it?